Daughter loves her mama. 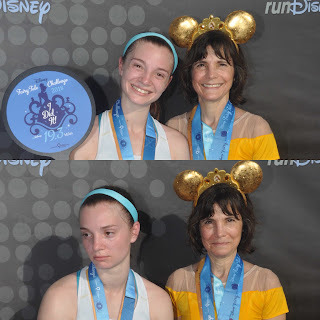 That is the only thing that explains why, year after year, she drags herself out of bed at 3:00am two mornings in a row to run with me in the Disney World Fairy Tale Challenge over Princess Half Marathon Weekend. She hates to run. Lest you think I'm kidding, let me tell you that although she is an awesome personal trainer, she runs only two days a year, both of them at Disney (ah, to be young enough to run 19.3 miles over two days with no running training!). She really hates to run. So, why does she do it? If you ask her, she will go into a long story about how the first year I ran, she didn't, and she swore that if she had to get up that early again, she'd better be running. There are a lot of people who line the race course who also get up that early, but who would never think that they should just get out there and run too. No, she runs because it is something we do together, just the two of us. It's our thing. We plan the costumes. We plan the character stops. I pace myself to her. No matter how much she hurts, she always kicks the last 100 yards to try to beat me (and usually succeeds. I have no kick). She starts wondering aloud why she's doing it at mile 7 of the half marathon, and by mile 9, she just wants to finish. It's what we do, and I so appreciate she does it with me. I enjoy doing it by myself, but I love it more with her. What's important about Daughter and Princess Half Marathon Weekend is twofold. First, that Daughter does it for us; and second, that I appreciate the gift. I don't ask her to run every race of the year with me; I don't expect her to run this weekend with me. I treat it as the gift to our relationship that it is. That last sentence is so important. What Daughter is giving is not a gift to me; it is a gift to our relationship which is given freely and generously. There are gifts I give to our relationship too, also freely and generously given. The gifts are not expectations. They are not demands. They are not one of a million gifts. They are jewels to be treasured - and I do. You might have guessed that I am an acts of service and quality time kind of girl. If you haven't guessed it, Daughter sure has. Some folks don't put a lot of stock in Chapman's theory, but I do, and here's why. Taking the time to figure out someone's love language and how to speak it, tells the ones for whom you care that you do indeed care enough about the relationship to make the effort. Even if the attempt is imperfect, just trying communicates caring and connection. Letting someone else who you love know your love language is scary. What if you let them know in every way possible how you want to be treated and how you want caring communicated, and they don't even make the attempt? Hmm, that's a problem for the relationship. What if you're an acts of service person, and they give you words of affirmation? Not so much of a problem, if they're words of affirmation folks and at least they are trying to communicate. Sometimes you have to adjust or educate, and in the end decide whether it is enough that they express love, even if it's not your core way. Relationships have their ups and downs. The depth of the connection often determines whether what goes down also comes up. When there is no up, I see you in my office. When there is effort at connection, I usually don't. Here in the Trenches. Let's talk depositions. Everyone knows about depositions, because they're the only form of discovery, or information gathering, that's interesting or dramatic enough to be put on television. Any TV show that involves a lawsuit, shows a deposition. For those of you who have never watched TV or a movie involving one, a deposition is the taking of oral testimony under oath outside of a courtroom in front of a court reporter. The person taking the deposition can ask any question that is likely to lead to finding evidence that is admissible in court. That means the person taking the deposition can ask almost anything that is even tangentially relevant to the case. That covers a lot of ground. 1. Tell the truth. No fudging, no shading, no exceptions to this rule. Your answers are under an oath to tell the truth. 2. Your testimony is extremely important to the case. If you are one of the parties to the case, your deposition testimony may be used instead of testimony at trial, or to contradict what you say at trial. 3. This is serious business. No chit-chat or small talk with the other lawyer; they are not your friend, even if they seem to be trying to be. No sarcasm, no facetious remarks. The cold transcribed record will not get the joke and it will reflect badly on your testimony. 4. Listen to the question. Take your time. Make sure you understand before you answer. If there is any part of it you do not understand, say so, and ask the attorney to repeat or rephrase it so you understand what you are answering. 5. Answer the question – not some other question – just the question you are asked. Say no more than is necessary to answer the question asked. Do not volunteer extra information or explanations. If the other attorney wants more information, let him ask follow up questions, do not volunteer. At a deposition you should adopt a defensive posture. This is not your opportunity to tell the whole story; the other attorney doesn't care and if their client is a jerk, they already know it. Save it for trial. 6. Do not guess. If you do not know the answer, say so. If you do not remember he answer, say so. It is your job to give the answers you know – not to speculate It is okay not to know or remember every detail or date. But if you answer, that is the answer that will follow you throughout this lawsuit. Answer only what you know. 7. You are the witness – not the lawyer. Do not argue with the lawyer for the other side. Do not object. Do not try to sell the case. Just answer the questions. 8. Watch out for questions that paraphrase your answers. A lot of times the lawyer may take your ideas and put them in other words – changing your meaning in ways that you might not catch at the time. If the lawyer asks if his paraphrasing is accurate, you are entitled to say that you would rather stand on your answer and stick with the way you put it. 9. Beware of absolutes. Watch out for questions that use the words "always" and "never." 10. If asked, admit preparing for the deposition. There is nothing wrong in going over your testimony in advance. 11. If I object – listen. If you are talking when I object, stop talking at once. An objection is a danger signal. It says you should put your mouth in the low gear and move your brain into high gear. Even if you think you heard and understood the question before the objection, ask to hear it again. 12. I am not allowed to interfere with the other lawyer’s questioning of you. This means that we may occasionally object, but we are normally not allowed to say anything, nor do anything to affect your answers. 13. If you think you have made a mistake in your testimony, let me know before he deposition is over. We will fix it. Mistakes cannot correct themselves. Make sure that you ask for a brief break, and then explain the mistake to me. 14. If you get tired, ask for break. If you need to go to the bathroom or to get cup of coffee, say so. And if you start to get argumentative or talkative – which is natural when you get tired – I will ask for break myself; in that case, don't argue that you don't need one. 15. This is the MOST IMPORTANT rule. Practice having your deposition taken. I know, you know your life better than anyone else, so that seems stupid. I bet, however, you've never had your deposition taken. It is an experience for which you need to be prepared as possible. You will react differently under the pressure of questioning, I guarantee it. Ask your attorney to arrange for a practice session. If your attorney can't squeeze one in, ask a good friend to take your financial statement and at least part of your answers to interrogatories or the pleadings and REALLY GRILL YOU on them. I mean, be really tough. Why did you say that? Where did those numbers come from? Didn't you really just make them up? Your spouse really didn't do X, so why did you say that? Practice, practice, practice being questioned under pressure. Tell whoever is helping you to be really tough. Take it seriously. Be able to give firm answers. Don't be wishy washy. Follow the rules. This is not a time to freelance. Here in the Trenches. I had a client who actually read the letter I send with the other side's discovery requests. I know, to you, that statement is not shocking. To anyone who toils here in the Trenches, that statement is worth framing. It gets better. Not only did this client actually read the darn letter, that I have spent years revising and honing, but she did as I asked. I requested her draft responses and documents in 20 days; she got them to me in 19. I requested that she answer all the interrogatories in Word and send them to me in electronic form; she did it. I asked that she go through the request for documents and let me know what she was providing and what didn't exist; she did it. I asked that she provide me all her documents according to request number, in chronological order and save it electronically; she did it - there was not one additional document I needed to get. I almost fell off my chair. She didn't tell me it was too hard to find or ask for the documents. She didn't argue with my about why what was requested was necessary to produce. She didn't moan and groan about how busy her life was (it is) and how she just didn't have the time to do what I requested. She couldn't believe I was amazed, because isn't that what I asked? Well, yes, but almost no one does it. She was shocked, because she couldn't fathom why anyone would want to pay hundreds of dollars an hour just to have someone else do what she did. Me either. Lawyers and their paralegals are expensive. Clients are always asking how they can save money on legal fees. I always tell them that the best way is to do as much of the things that they are able to do as possible, and save the lawyer for things that only a lawyer or a paralegal can do. Organizing documents by date, scanning paper and typing complete answers to questions in a format that is easily transferrable to another document are not things that only legal personnel can do - they are things most people can manage. This client probably saved herself $1,000 or more by doing what I asked. Sometimes, your lawyer really is trying to save you money, if only you put in the effort. Here in the Trenches.